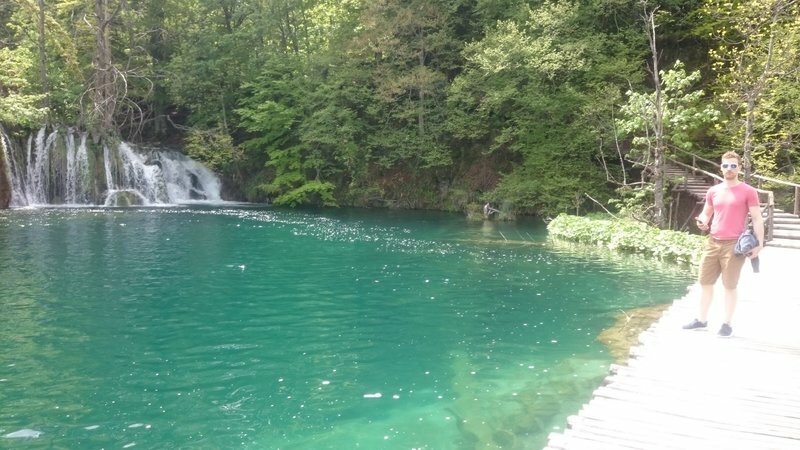 This trip was actually my first holiday after returning from backpacking in November 2014. 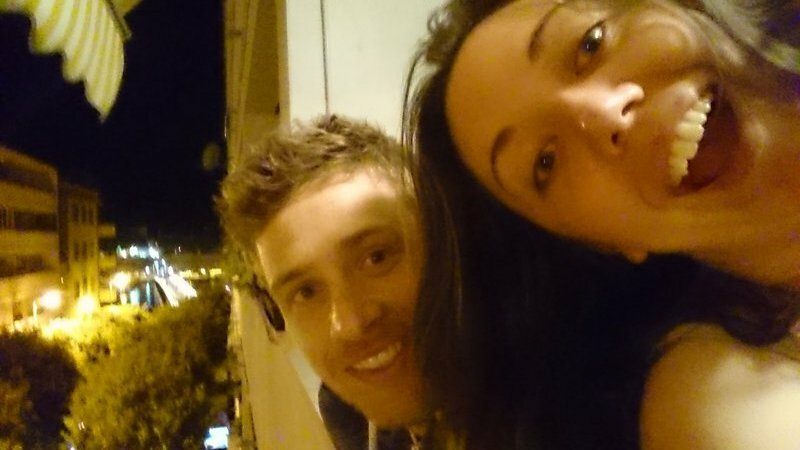 I had met Peter over Christmas 2015 and it was also our first holiday together. Pete had never been on a ‘backpacking’ holiday before, and I remember taking him backpack shopping a few months before the holiday. We must have picked right, since he still uses that same bag today! 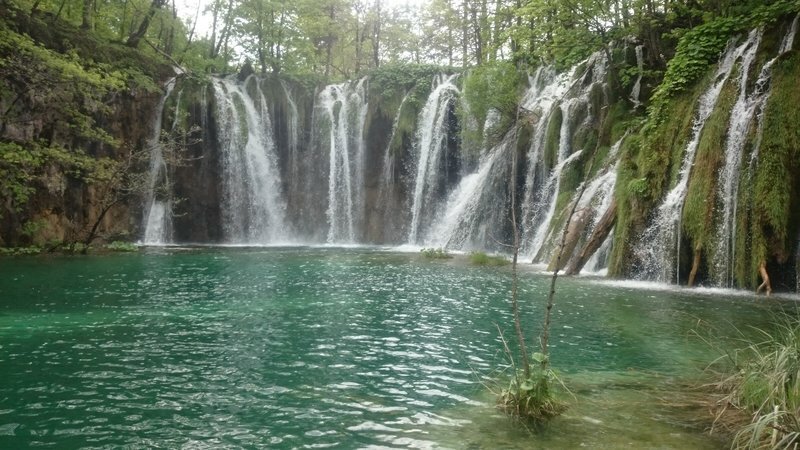 Here you can view all my blog posts from our trip to Croatia in May 2016 in chronological order. 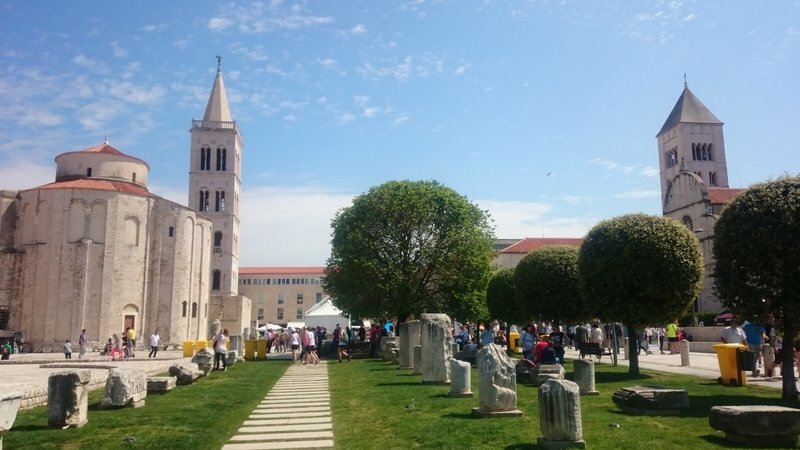 We arrived in Zadar by a super cheap RyanAir flight (£60 return!). We were met in arrivals by a representative from AutoEurope who we had booked the car through. 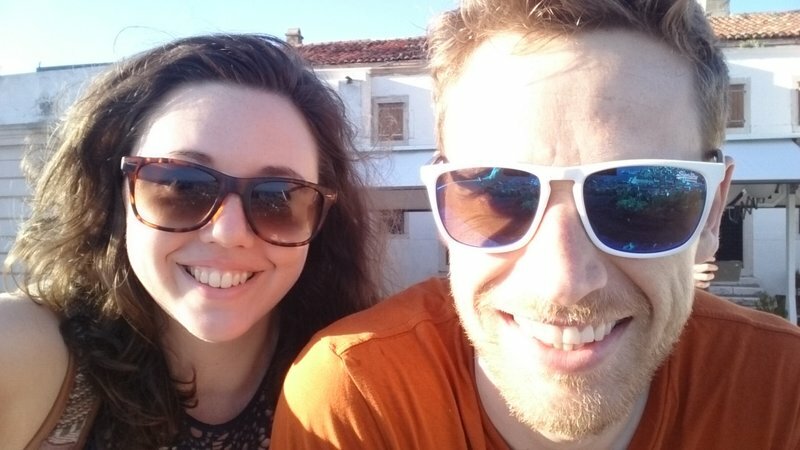 We got the car hire for a week for £40 and I paid about £10 for a separate carhireexcess.com insurance cover to avoid taking out the premium daily cover. The car was hilarious…! 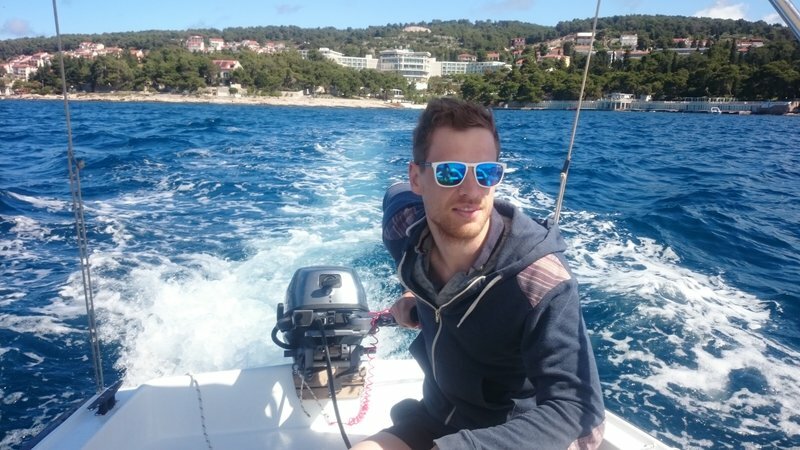 Pete described it as a ‘boat’, but sadly I didn’t get any photos of it… it was a white Suzuki – a sx4 I think, a massive car with a tiny engine! We sorted out the paperwork but the guys were so casual about it we just ended up chatting to them for ages. We set off from the airport with my phone (and offline maps) at 2% battery… sure enough after about 5 minutes we were in the middle of nowhere with no sat nav. 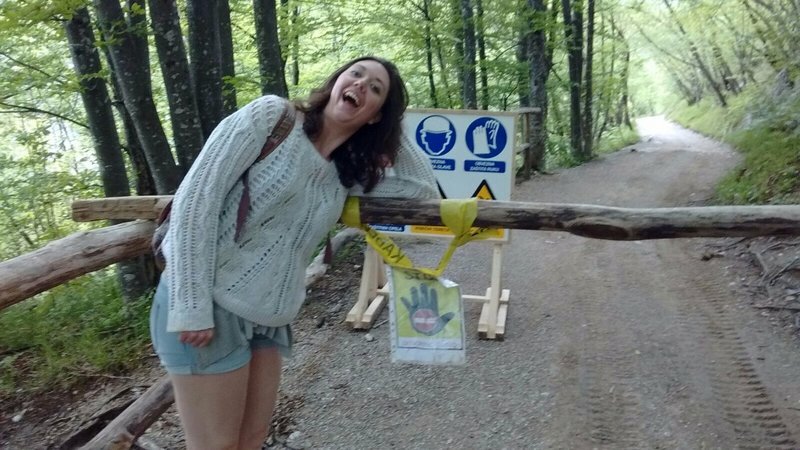 We continued to follow signs to Zadar old town with stress levels rising. Luckily our route took us past a McDonalds – all hail Maccies free wifi!! With the free wifi, we were able to get the maps up and find out we were only 5 min from the hotel. 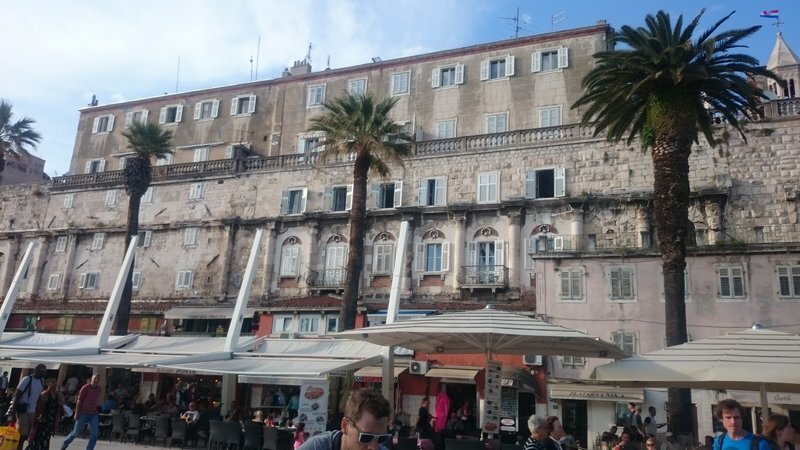 Of course, we had to sample what Croatian McDonalds is like – I can confirm, it is the same as in the UK! 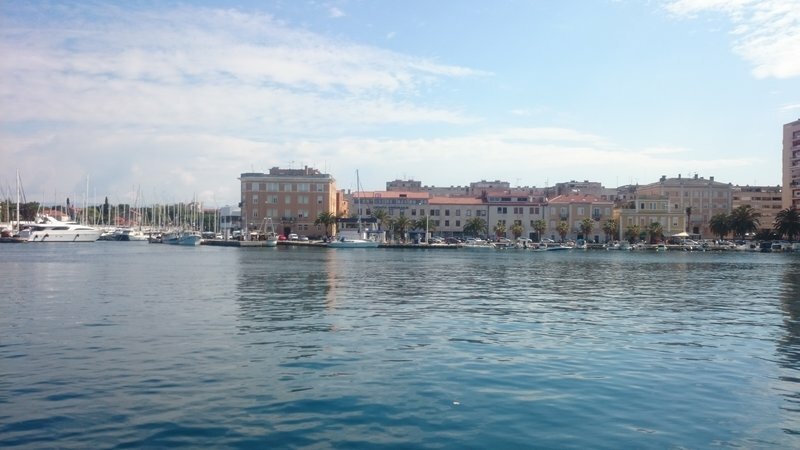 We checked into our hotel ‘El Mirador Rooms’ just on the outskirts of Zadar old town, 1 block from the footbridge over to the walled peninsular. View from the Balcony at midnight! The following morning we woke up to a beautiful sunny day and Pete went out to get pastries and ice coffee to have on our balcony. 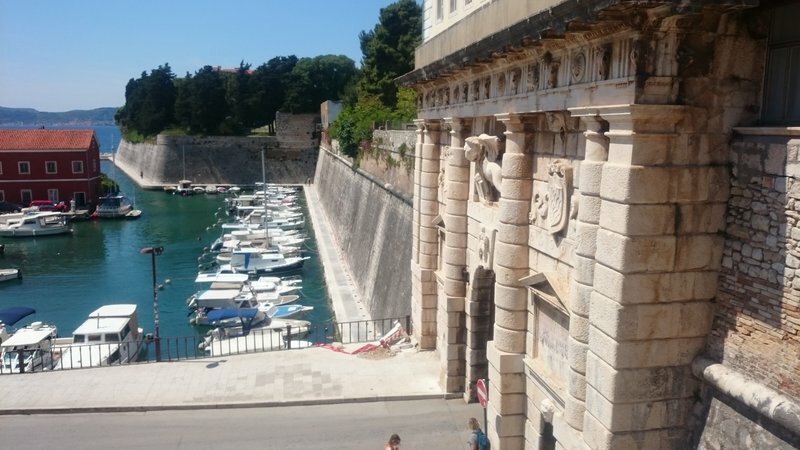 A short walk took us over the pedestrian bridge and into the walled old town; the colour and clearness of the water was unbelievable, especially considering it was a busy harbour. 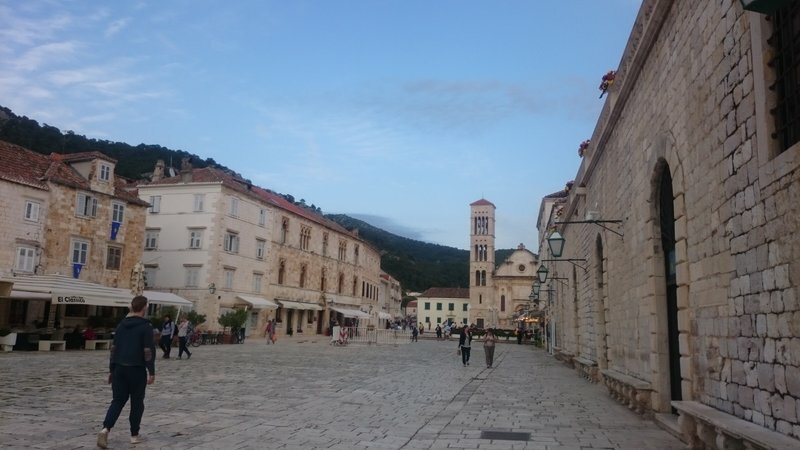 We spent the rest of the morning walking around the old town, visiting the main cultural and architectural sites. 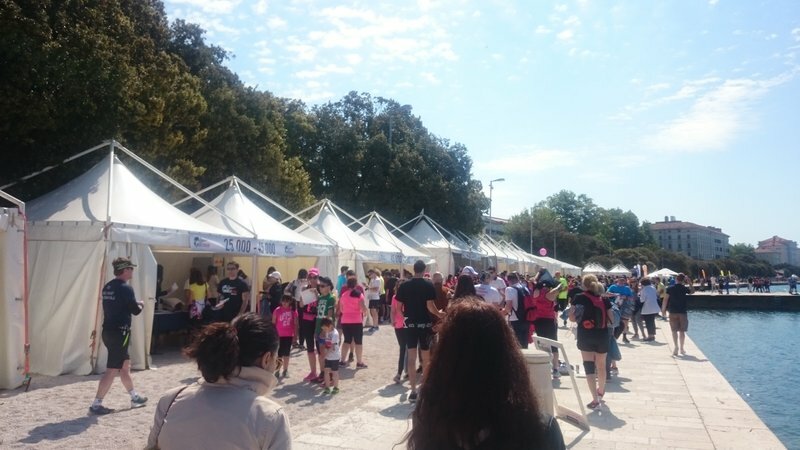 One of the more unusual sights was the Redbull World Run which was on in the town that day. The streets were heaving and EVERYONE was wearing tights leggings. Pete didn’t know where to look! It was interesting for people culture in that sense too and we also spent a large portion of the day people-watching (aka bum-watching). haha! 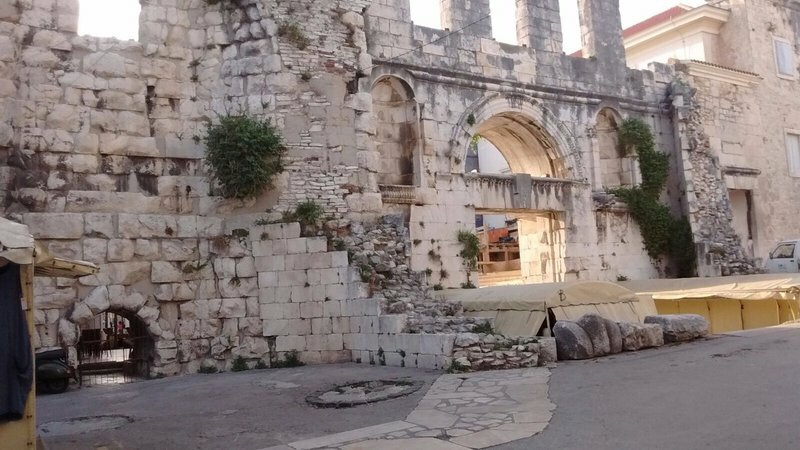 As the day continued, the town started to get more and more busy, so we explored some of the more quiet parts of the old town, the East side, which we saw was not part of the World Run. 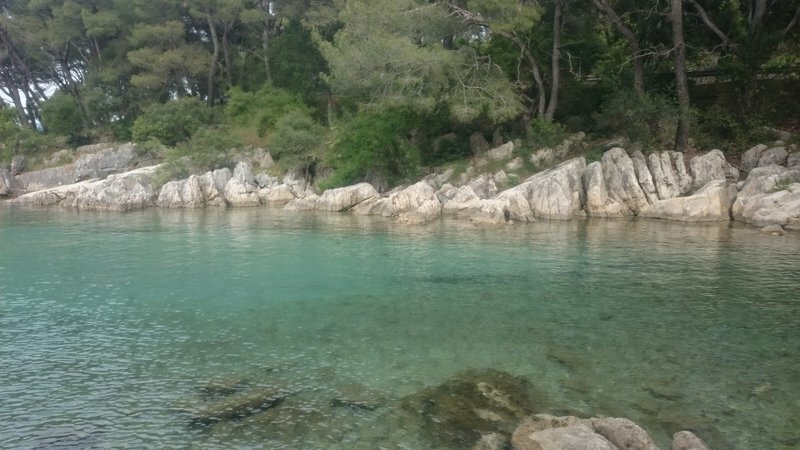 By mid afternoon the run was underway and so we decided to escape the city and explore one of the local beaches – the beauty of having a car! We packed a bag and drove out to Nin’s Beach in Nin. 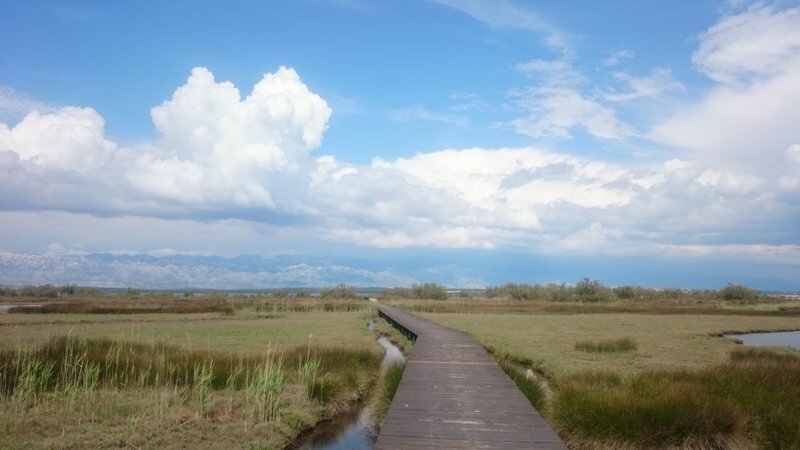 This was so quiet and tranquil and the setting was beautiful with the Velebit and Paklenica Mountain ranges in the distance. The beach was sandy, and the sun was hot, but the water had a cold bite to it. So we found a lonely tree and camped under there, watching a distant thunderstom over the mountains – the lightning was incredible. 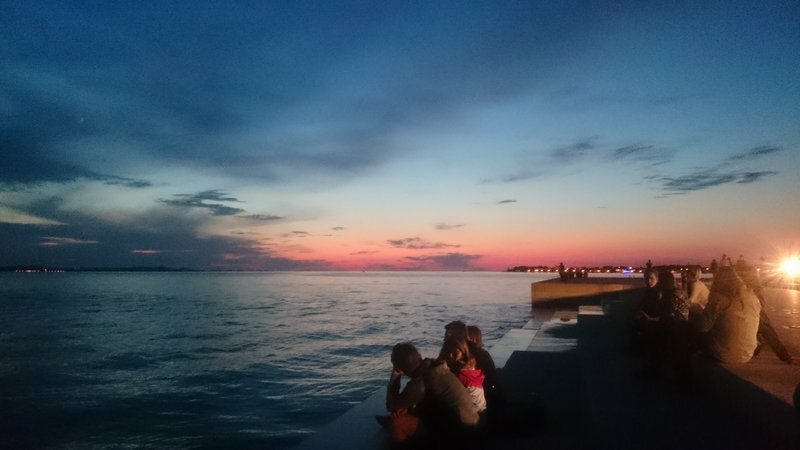 That evening we ventured out into the Old Town again and sat on the Sea Organ to watch the sun set before getting lost amongst the many bars and clubs down the tiny winding side streets. 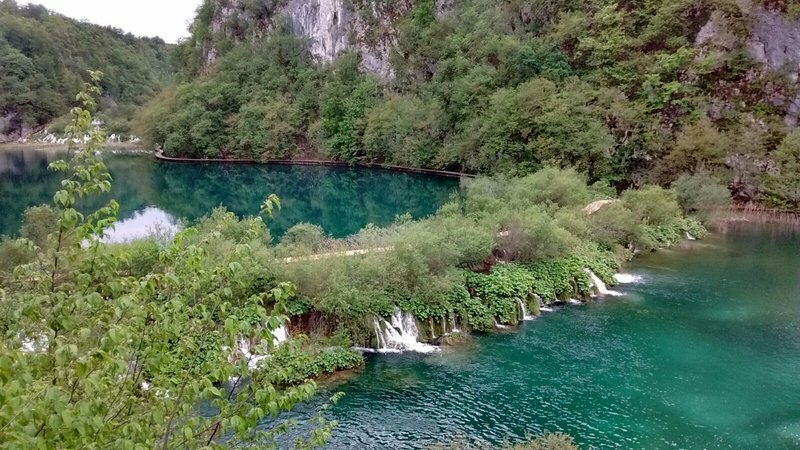 View Croatia Trip on Libbytes’s travel map. 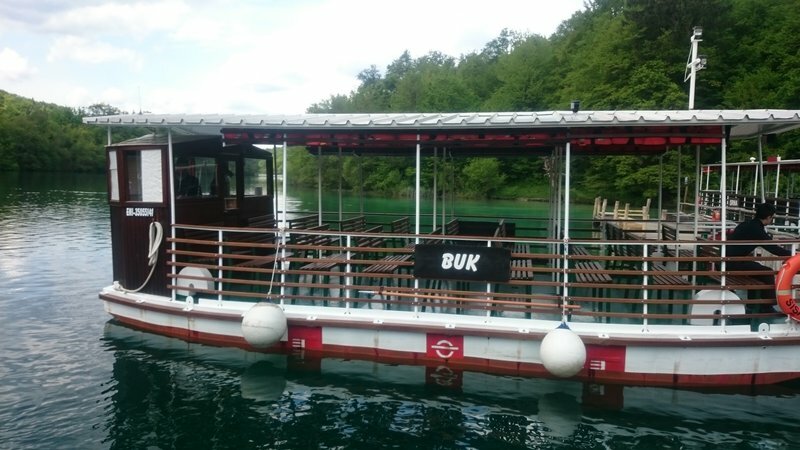 After a bit of research we found that most of the motorways charge in toll booths along the way, but that there is another route from Zadar to Plitvice which avoids the tolls and goes via the D1, so we charged the phones, set the maps and set-off for the mountains in our boat! 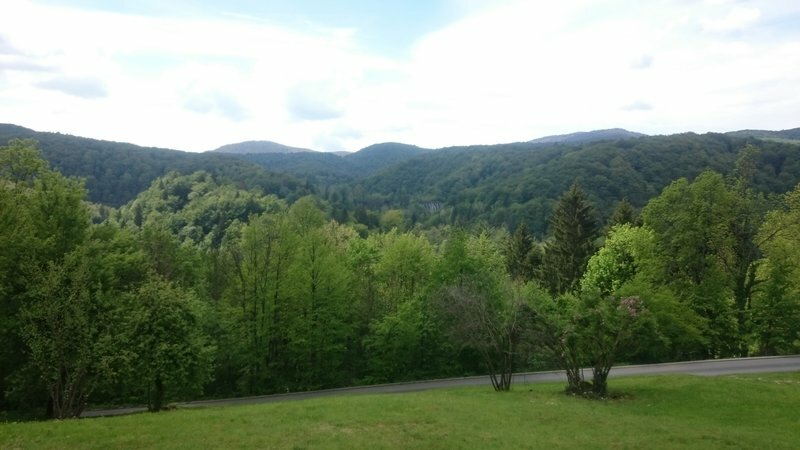 The journey was incredible, the views over the Mountains and valleys was really something. 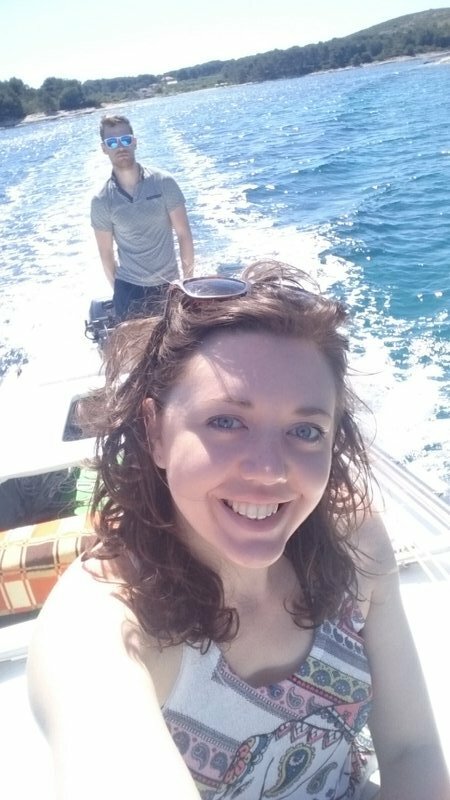 The roads were great too, we had to watch out for some speed cameras, and overtaking in our boat was a little tricky and required a run-up, but that was all part of the fun! Pete just kept saying “ahh… imagine these roads in your car” but we did come to love our little boat. 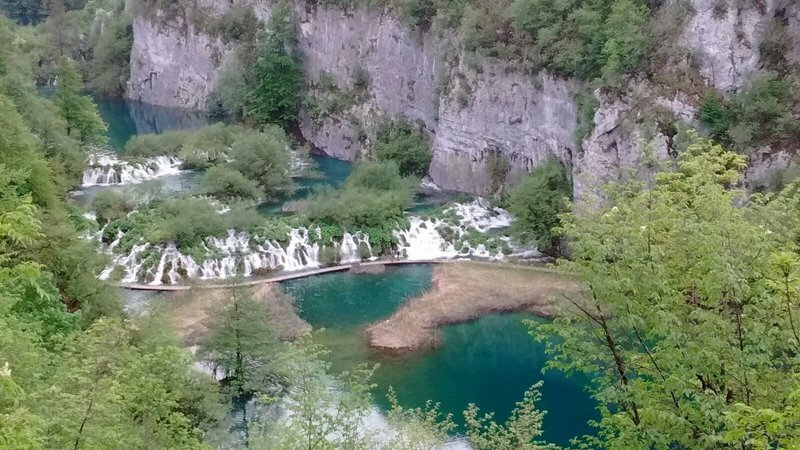 The journey to Plitvic didn’t take that long only around 2.5 hours, so we went straight to the National Park and got some food and rest before setting off the see the sights. 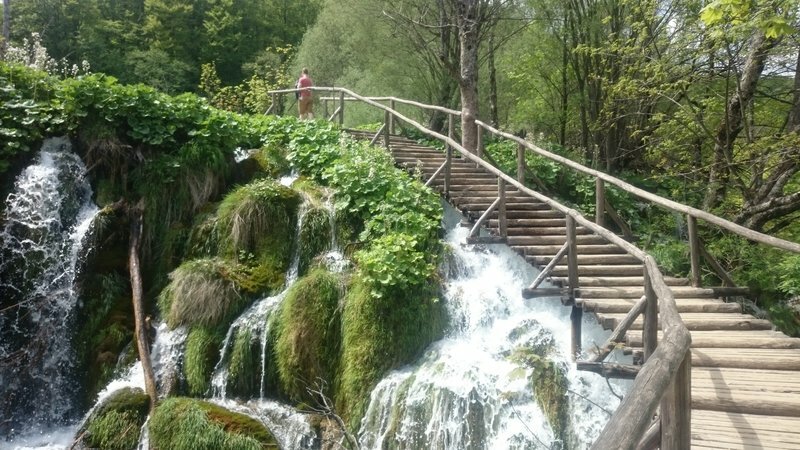 There are only so many adjectives to describe something so beautiful and amazing as this place so I won’t try to, I’ll just put the photos here and say that the park was so well maintained – the walkways were superb, steps up over a waterfall and wooden walkways over a sheer drop or the lakes… Stunning. The walkways were relatively quiet, I think the overcast weather and the month of May helped because I had read that this place gets very busy in high season. 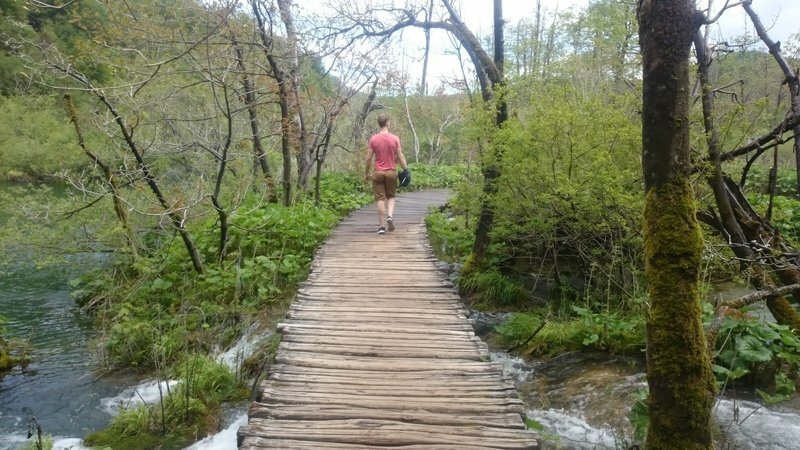 But actually, we found it very peaceful… especially when we got to a bit that was closed for repairs and ‘out of bounds’… it looked fine so Pete and I decided to sneak over the barriers and continue the journey to the tallest waterfall in the park. 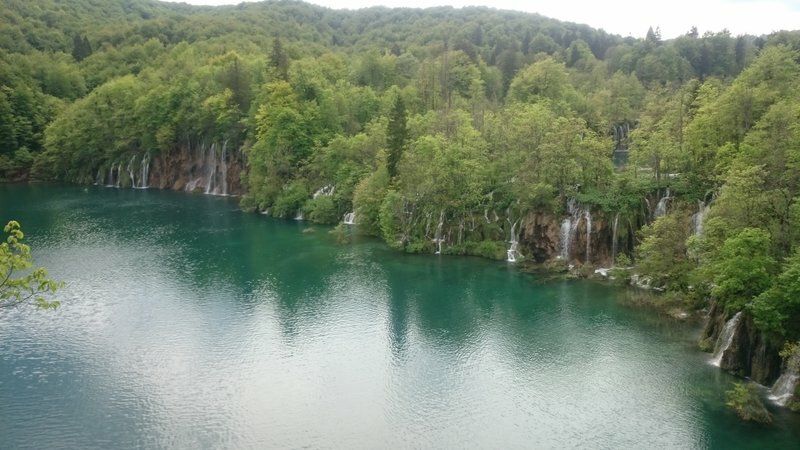 We had booked to stay in Korenicko and around Plitvice for another full day and night, but when we woke the next morning the weather was awful, very cold and raining. 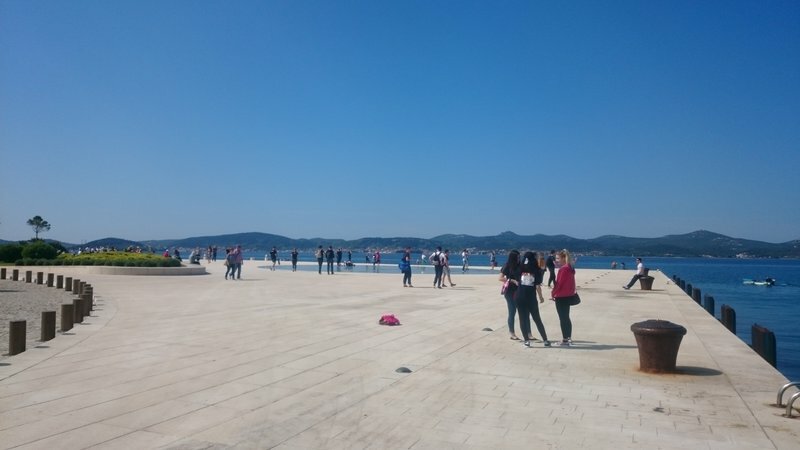 The forecast was grim for the rest of the day too… so… I literally googled ‘where is the hottest place in Croatia today’ and it suggested Split…. 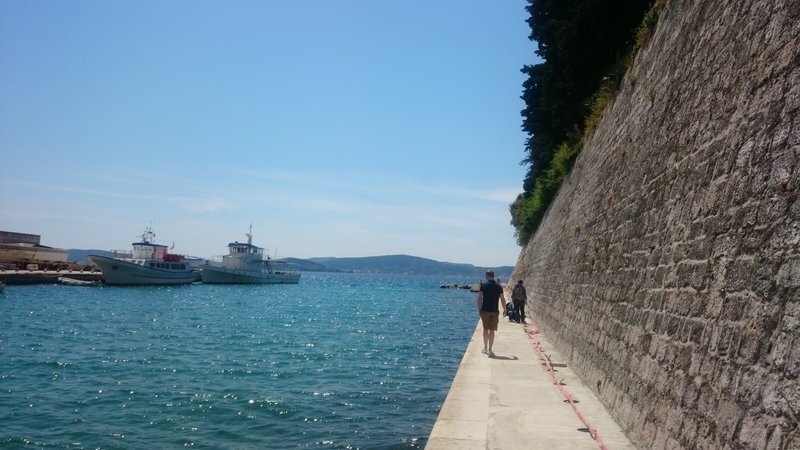 Luckily, I had planned the next leg of our journey to be to the island of Hvar, and Split is the port which runs ferries to Split, so off we popped to Split – A day early! 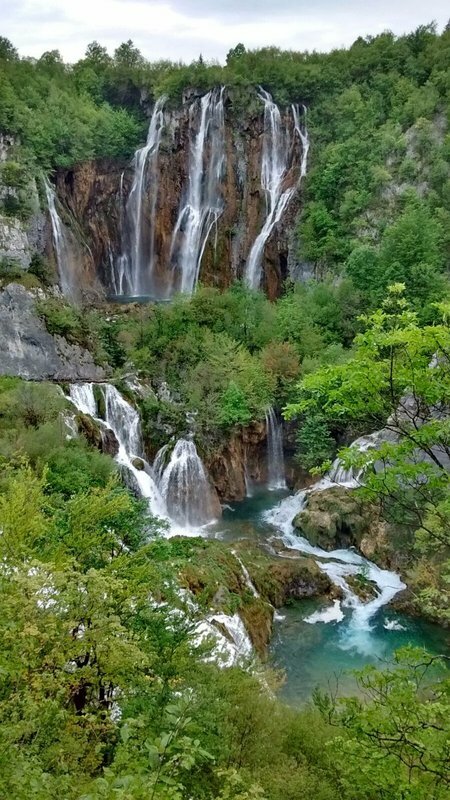 The drive from Plitvice to Split took us down some insanely beautiful roads, as well as roads surrounded by interest and mystery. 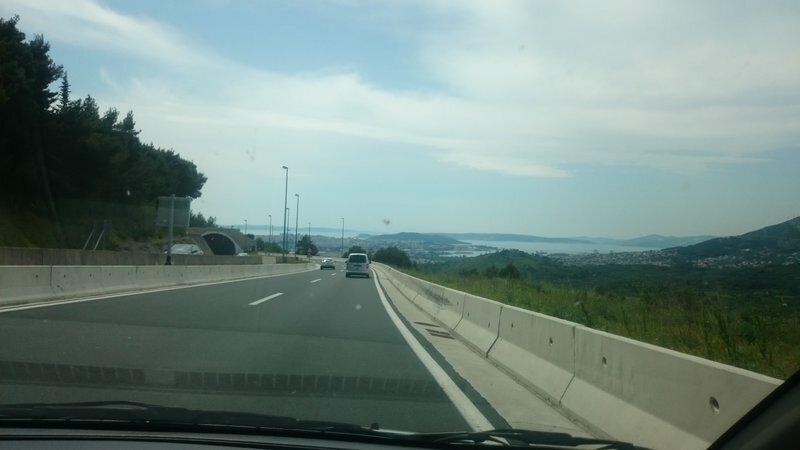 To avoid any toll roads, we took the D1 again, this time the full length into Split. At some points, we ventured through obviously military towns, which had nobody in them… (aka full camouflage gear :P). Otric was the strangest town, lots of derelict houses and walls with multiple bullet holes. We could only assume was a result of the Bosnian war. 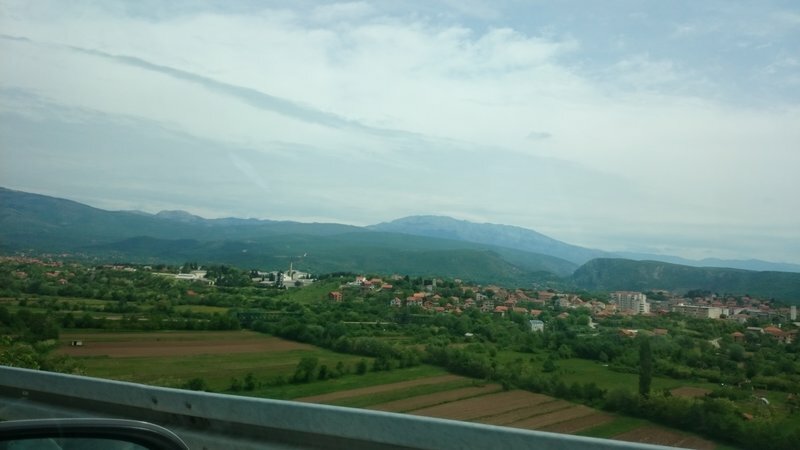 It was a bit eerie driving through these villages… but it was fascinating. 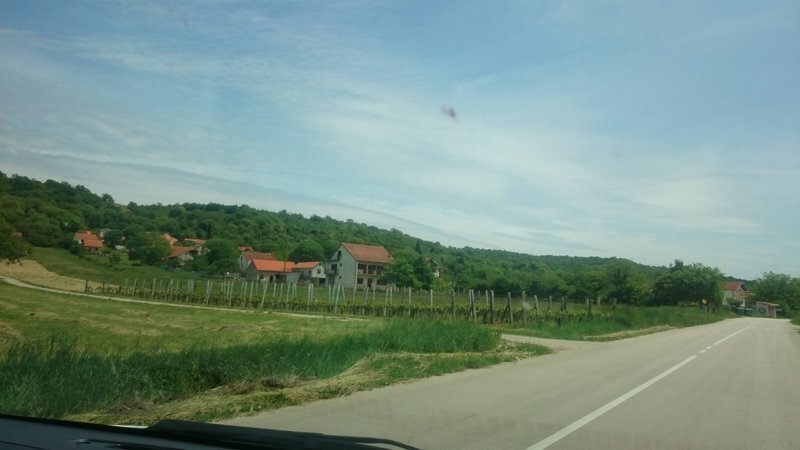 The further down into the valley we got, the warmer the climate got, until we were driving through villages where every house had their own grape vines in the garden! 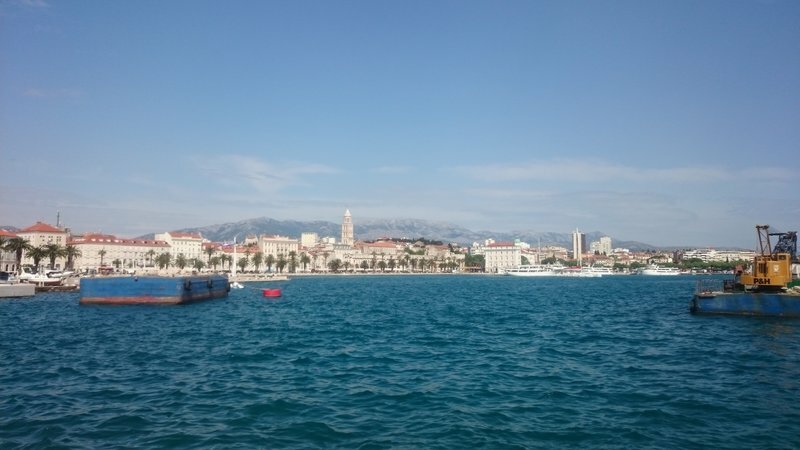 We eventually arrived in sunny Split and I booked a room for the night at the last minute, we stayed at ‘Guesthouse F’ which was very pleasant and had wonderful owners who helped us a lot. Once we got parked and checked in, we went down to the harbour front where we noticed a lot of bike rental shops. We looked around for a bit, but then decided the best place was ‘Toto Travel’ which rented us pretty decent mountain bikes for 80 Kuna each for the half day we had. 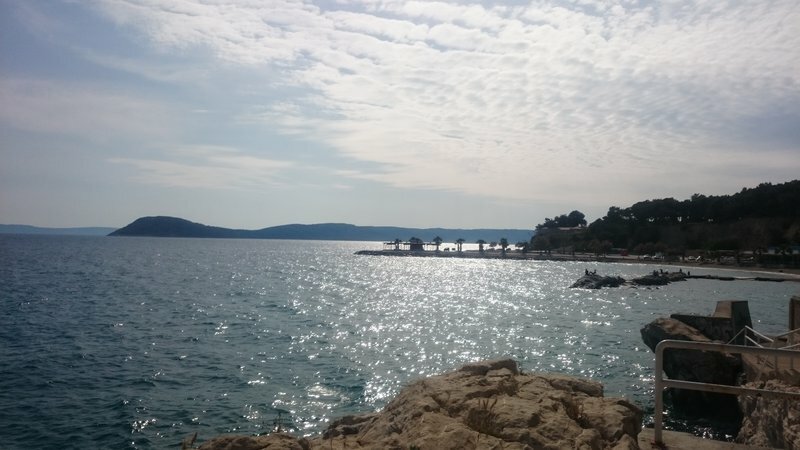 We set off West from Split and ended up pretty much circling the full split peninsular and Marjan Park. 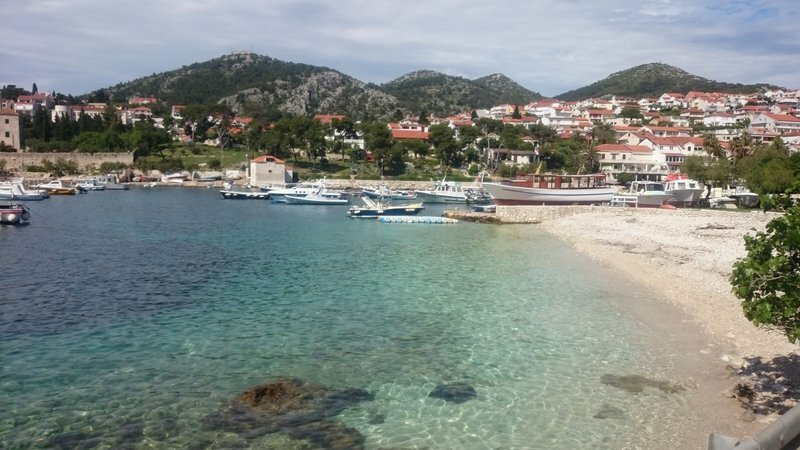 We found a few nice beaches on the Western side of the park and then headed back to the North of the peninsula and back into the town where we then cycled to all the Game of Thrones filming sites in the old town. That evening we went to a little bar which had the football on and drank far too much with all the Liverpool fans! 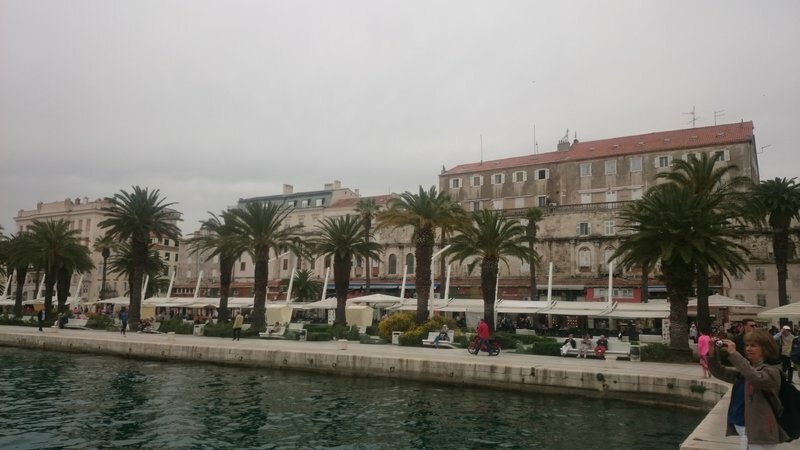 The following day we had planned to leave the car in Split (since the guesthouse owner found us a great spot and agreed to keep an eye on it for us), but unfortunately, the seas were too choppy for the catarmarans to Hvar town, where we had planned to stay. So we had to wait for the ferry instead which would take us to the other side of the island. 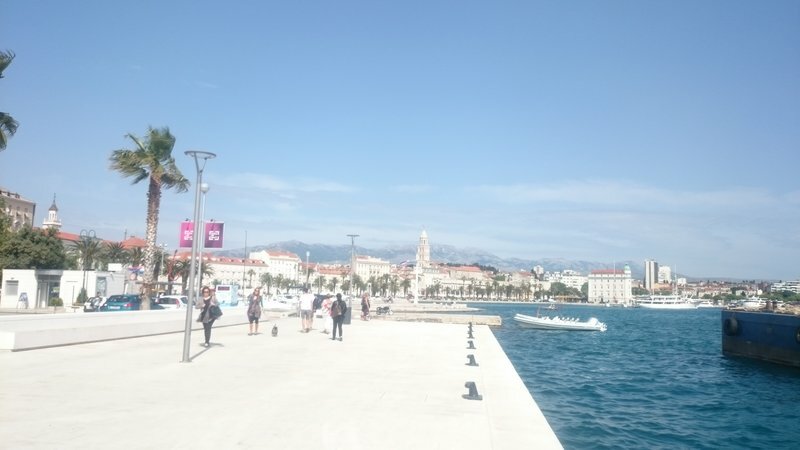 We spent the rest of the day mooching about Split, eating and drinking coffee! 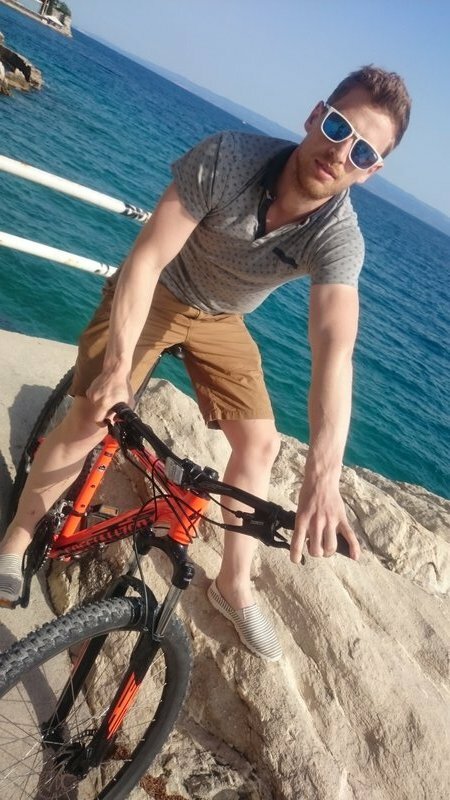 We liked Split, but mainly because of the Bikes, it was much more expensive than any place we had been so far and definitely more touristy. I think again we benefited from it being offseason as I think during summer there would be too many people here! 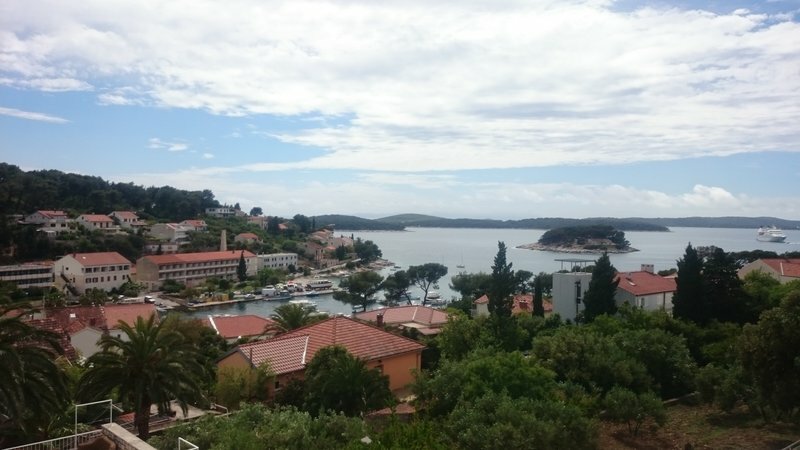 Hvar, along with the Plitvic Lakes, was the other crucial place I wanted to visit, mainly because of what I had read about the Pakleni islands and the natural beauty of the ocean here…. 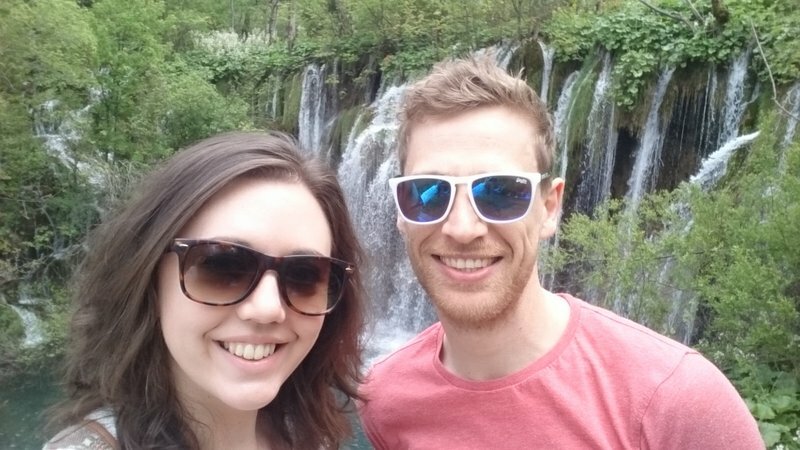 It did not disappoint and Pete and I had our best days in Croatia here. 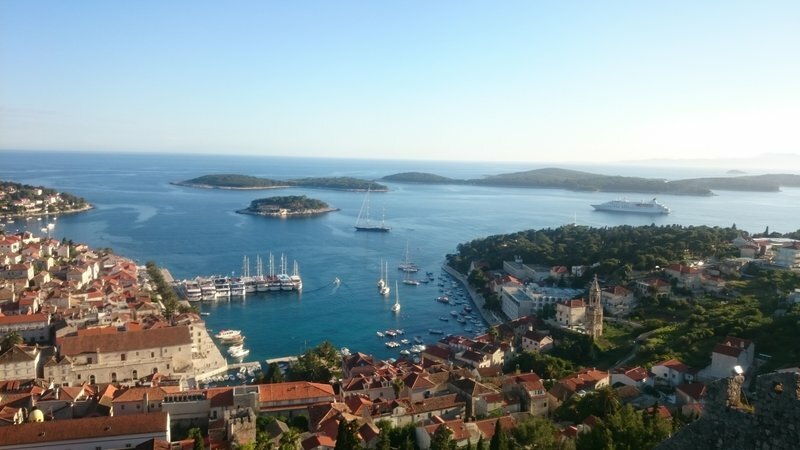 We finally arrived in Hvar town and again, thanks to being off-peak, we found peace and serenity. The first day in Hvar we rented mountain bikes from one of the shops in the town and headed out to some of the beaches on the South side of the island. they were quiet, peaceful, stoney and COLD! I didn’t dare go in the water deeper than my knees; it was freezing! 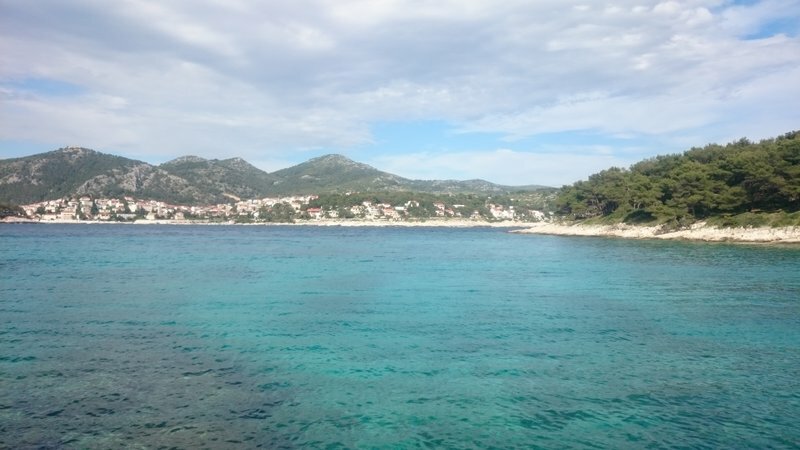 When we got to basically the end of the road, we turned around and went back into the town and out to the beaches to the West of Hvar town. 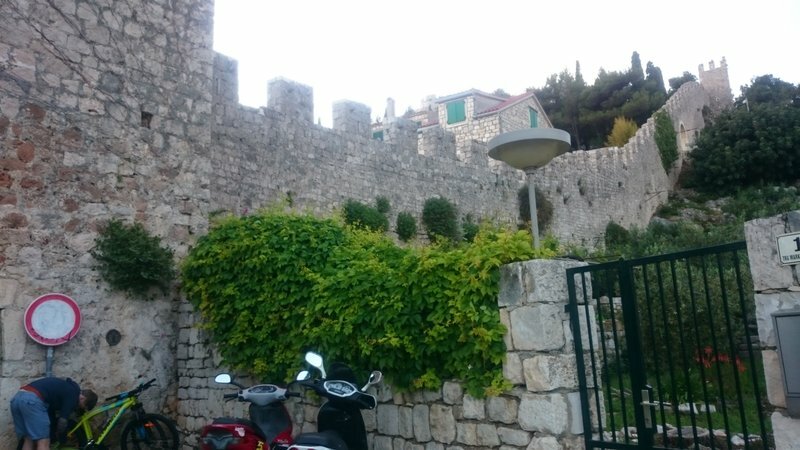 This area of Hvar was more developed, but all the restaurants and hotel resorts seemed to be preparing for summer, painting, building and fixing the seats ready. We felt so lucky to have most of it to ourselves. 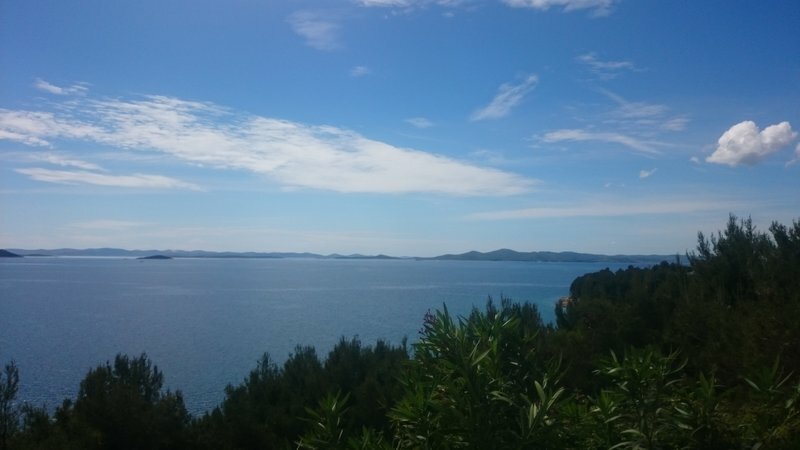 Again we reached the end of the road, so this time we decided to go North out of Hvar and up the steep hills up to the viewpoint of Hvar Fortress, this was my favourite bit, as you got the most incredible views out over the Pakleni Islands and the town. It was also lovely and cool up there in the wind. 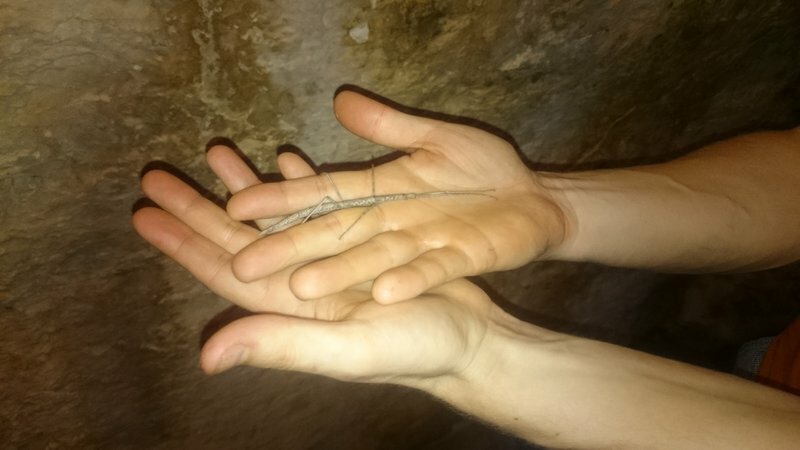 Making friends in the jail of the fortress! 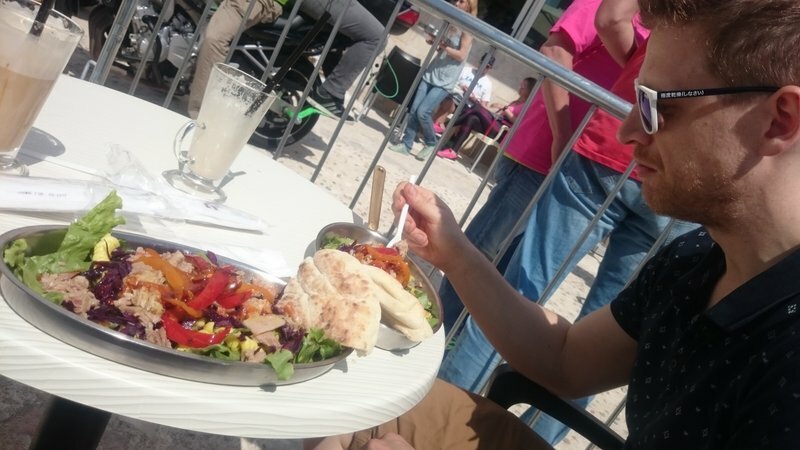 So, in Hvar town, we decided to change that, up our budget and splash out on some good food. 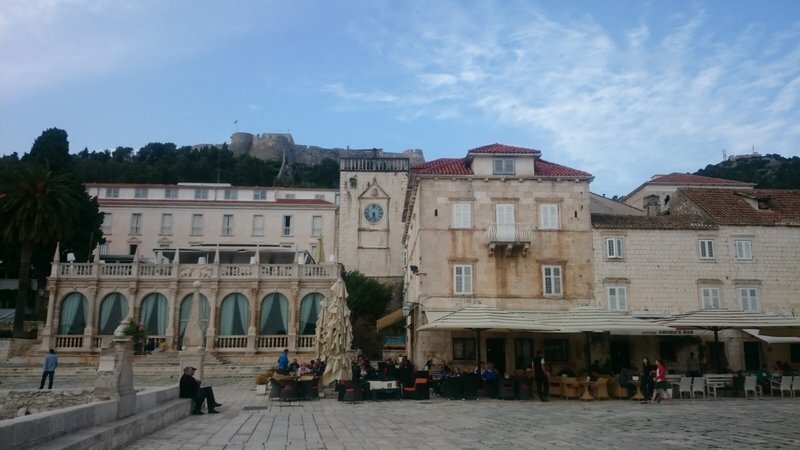 We tried Dalmatino Restaurant, just in Hvar town and it was amazing, well worth the 40euro we spent there for the next couple of evening meals! The service was amazing and they brought small aperitifs and liqueurs between every meal. My TripAdvisor review is here. The next day we had always planned to hire a boat, we got one for £25 for the day from a friend of the Hostel owner; which I thought was a bargain. The whole day was amazing. Pete got to play captain and he was amazing at it, and I got to sit on the front of the boat and look at everything enjoying the sights! 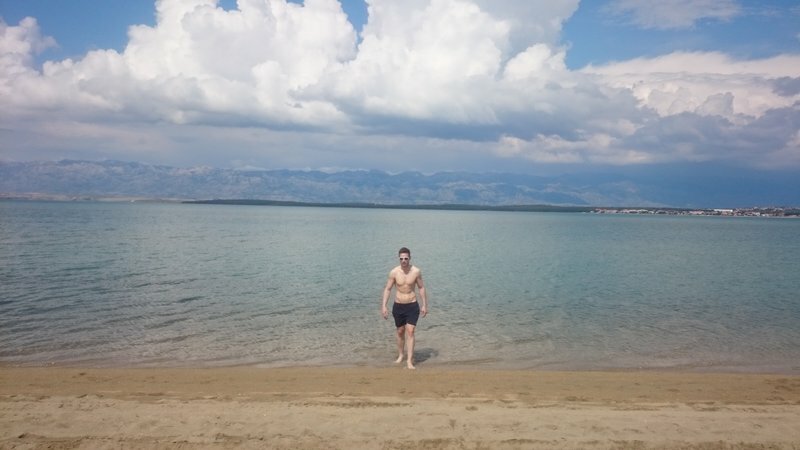 We drove out to the Pakleni Islands, stopping at a few of them to visit the beaches. 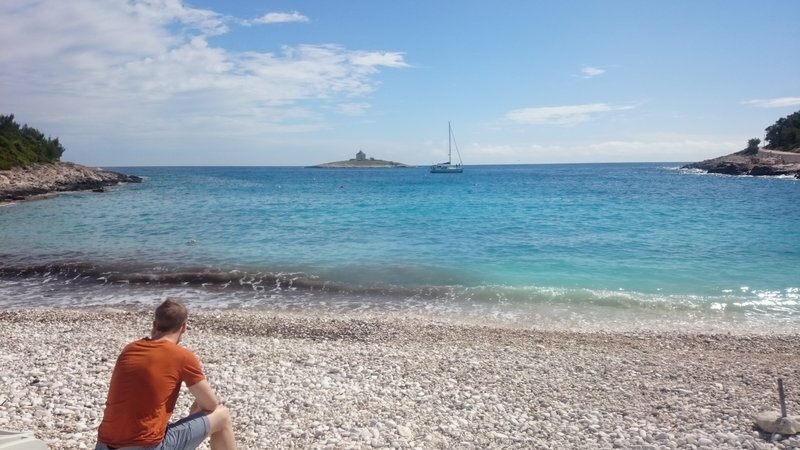 However, the boating wasn’t all rosy as we had some issues when it came to anchoring… The first place we stopped was Palmizana, where the idea was to park the boat and walk up and over the island to a nice beach on the other side where there were nice restaurants. 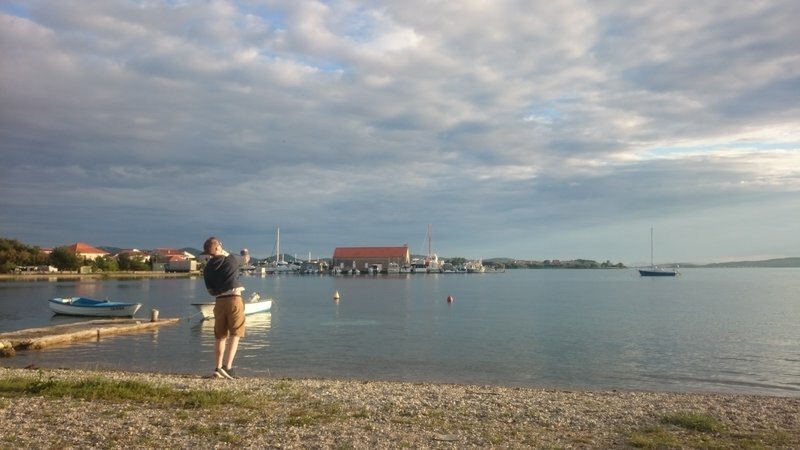 When we arrived there was a long Jetty to moor on, so we did, before someone shouted that we would have to pay to moor there… being the ultimate thrifty travellers we moved to somewhere else and dropped the anchor…. Then we saw that there was a small boat house which was free to use and had a lot of similarly sized boats in it… unfortunately, when we tried to move we realised we were stuck! The anchor was completely wedged in a chain on the bottom of the sea. We tried to break it free for about 15 minutes before Pete decided there was only one last resort before cutting it off and leaving it there; he stripped off and jumped in! Using the anchor rope for guidance he shut his eyes and dove to the bottom to free the anchor! It worked! He must have dived 10 metres. He got back in the boat shivering – the water was NOT warm. But my hero Peter saved the day! Unfortunately, the beach wasn’t sandy and the rocky ones aren’t the most comfortable! 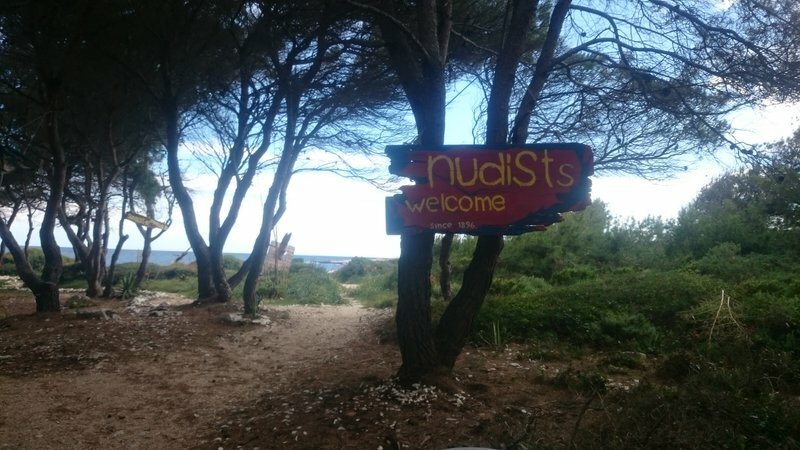 We then headed over to Jerolim island which apparently had a nudist beach… but sadly there was nobody else there except some repairmen working on the restaurant – fortunately their clothes were intact!! 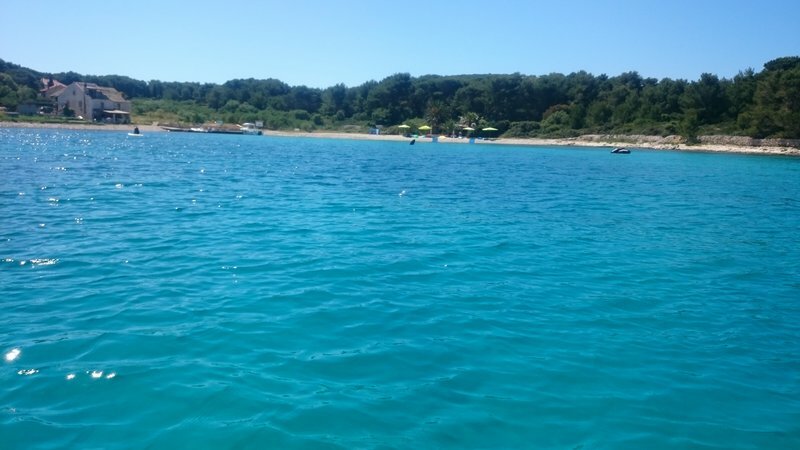 When we returned to the boat from this beach, the anchor was once again stuck, but this time much deeper than before. 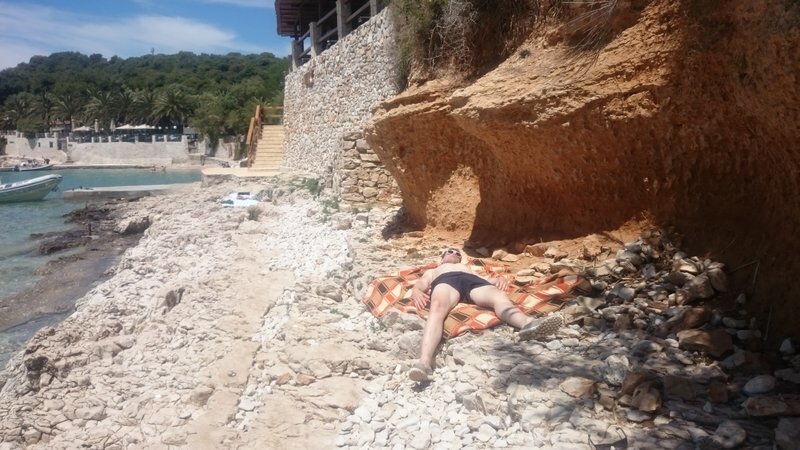 It was also later in the afternoon and a lot cooler – needless to say, Pete did NOT want to be a hero again. So instead we manoeuvred the boat to try and dislodge the anchor. 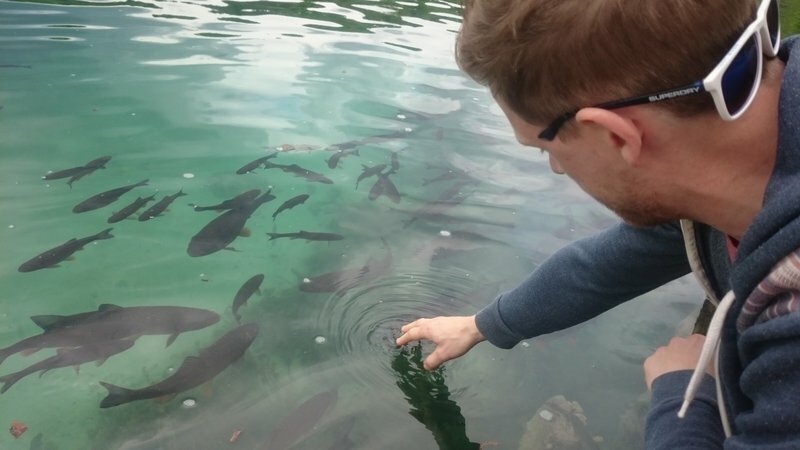 Luckily, the water was so clear you could see exactly what you were doing and after around 15 minutes we were free! 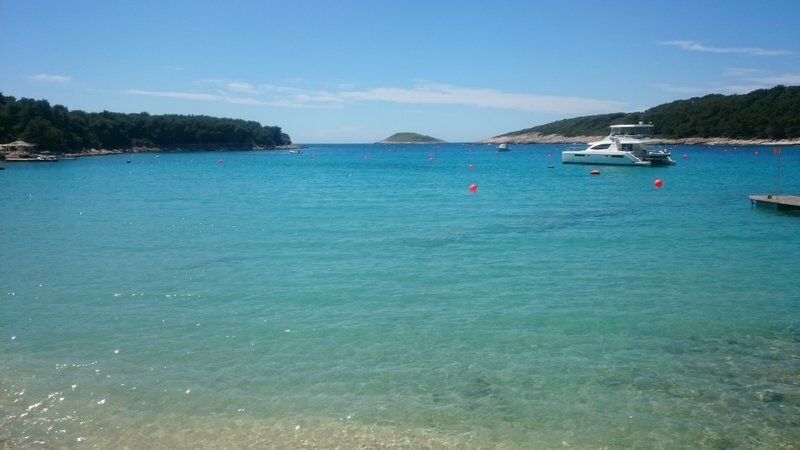 All in all, it was a great day on the boat, the Pakleni islands were peaceful and beautiful but maybe they would have been more interesting with a few more people and some open restaurants! 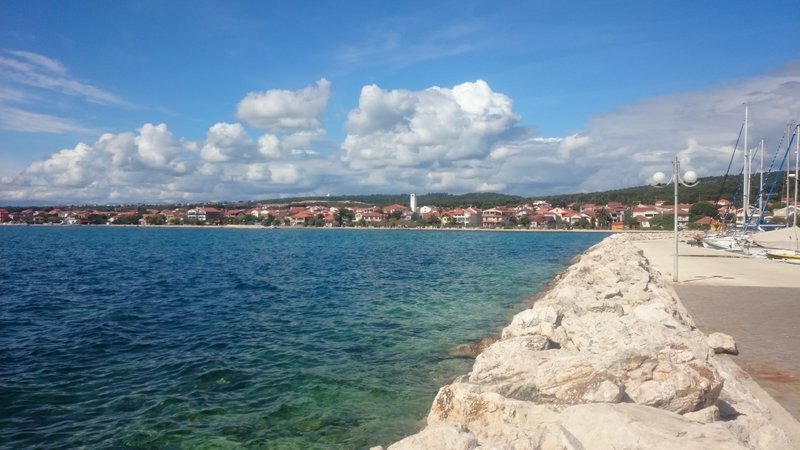 The next day was sadly our last day in Croatia, but our flight home was late at night, so we decided to take a nice leisurely trip back to Zadar via some of the coastal towns along the way. The catamaran was running again, so we got the first one out in the early morning back to split directly. 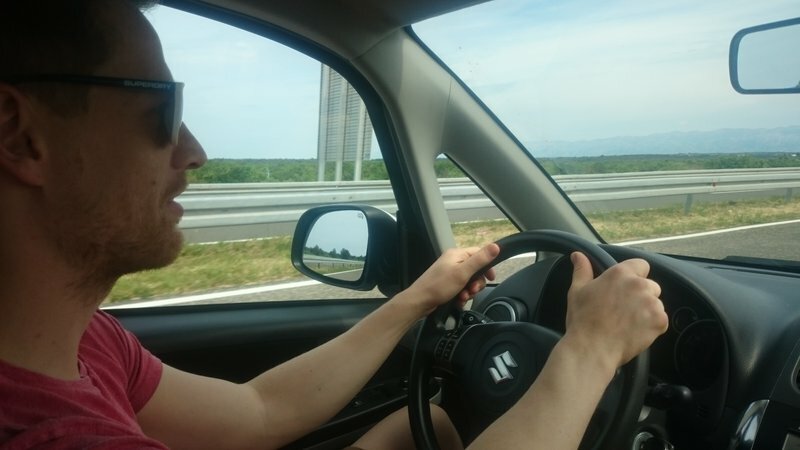 We picked up our car which had stayed safe in the back streets of Split and headed out on the coastal route to Zadar. 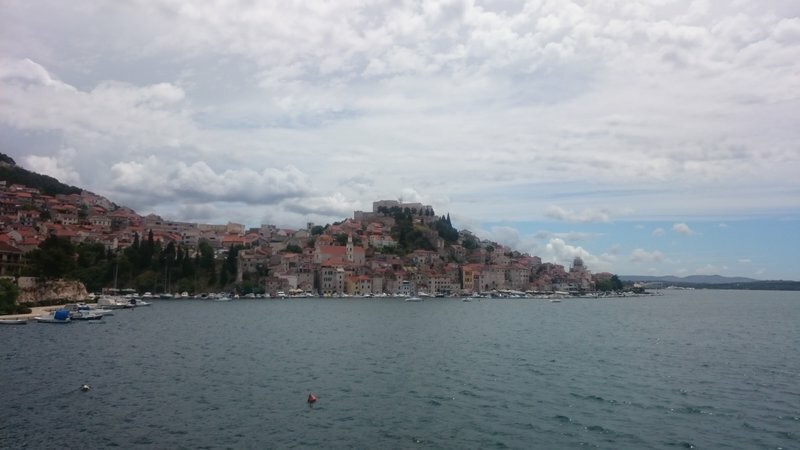 We headed first to Sibenik and stopped for lunch at a lovely little vegetarian cafe before heading up towards Skradin where we planned to visit the Krka national park which was supposed to be like Plitvic. 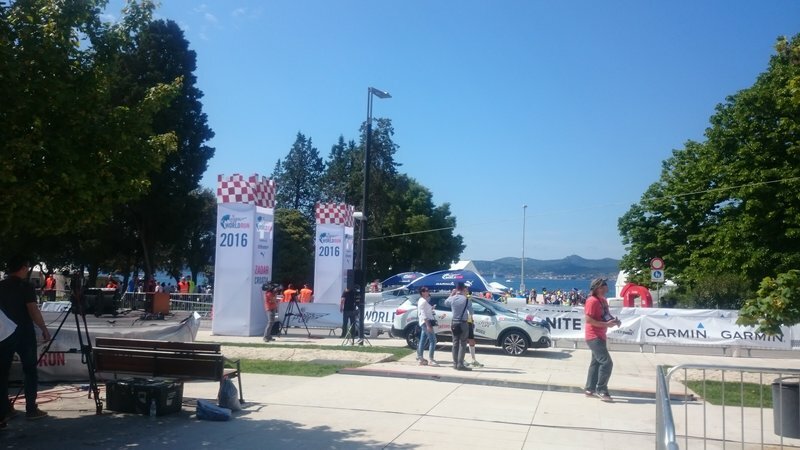 However, the entry fee was very high and it seemed much more touristy than Plitvic and not as nice, so we decided against it and continued on the coastal road. We stopped at a few more places along the way, but we spent the longest in Sukosan, walking through the village and having an above average meal for once! We spent the rest of the evening trying to hit a buoy with stones on the beach. 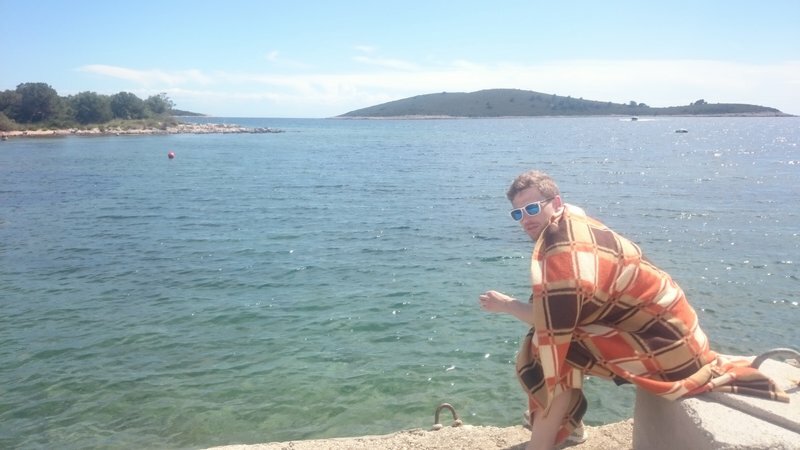 As a whole, Pete and I loved Croatia. 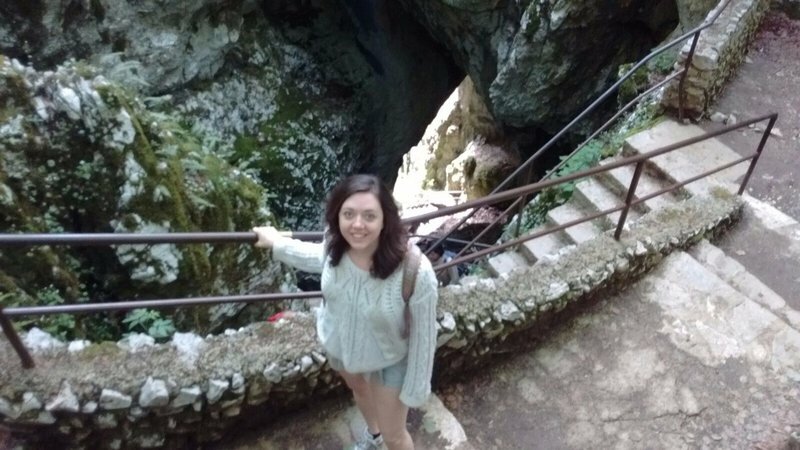 I split the trip up into 3 parts really, trying to capture Croatian architecture and culture, natural beauty and relaxing adventure. I think we certainly achieved that in the very short time we had; we really got the most out of our trip. 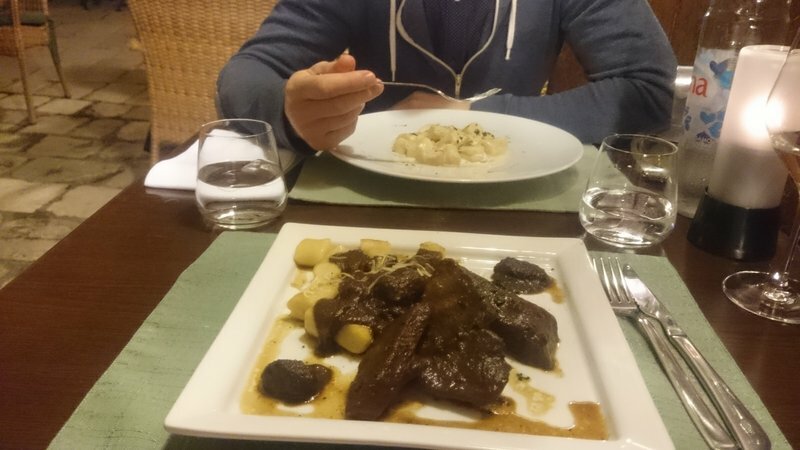 Although we both agreed that without Dalmatino restaurant, our opinions of Croatian food would have been very low. The salad on the first day and the pizza on the last day were the only other saving graces… But really what I will take away from this holiday is the beauty of this country. The natural landscapes are incredible and the architecture and style of the towns make for very pretty pictures. 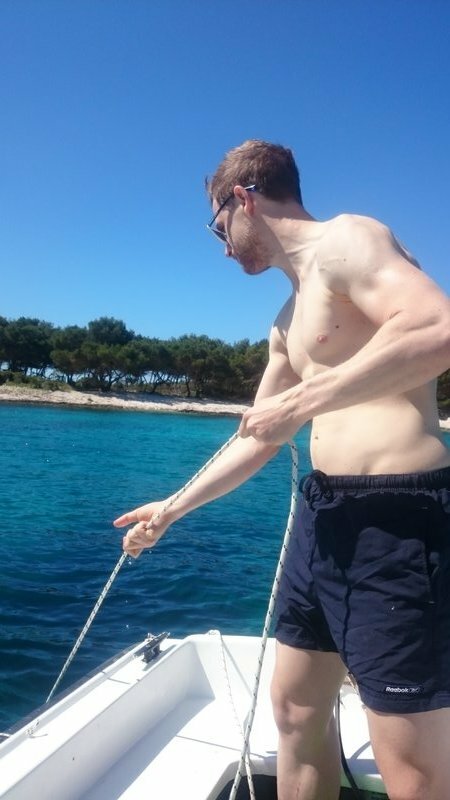 Would we come back to Croatia? I think the priority to return anytime soon falls below our desires to explore new places. 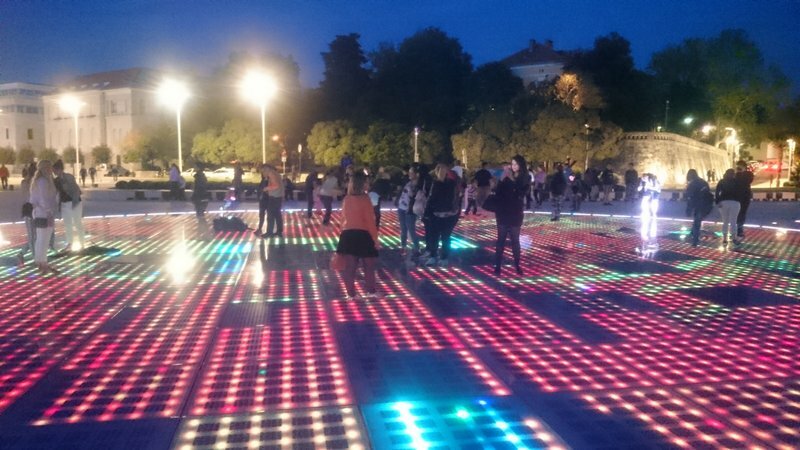 So, for now, Croatia, we’ll see you around.